Our band's fundamental mission is promoting patriotism through music. Throughout the nine month season beginning each September, every Thursday evening our band either rehearses in Fargo or travels to perform in the Fargo-Moorhead area or within about a 100-mile radius. While patriotic music is included in every performance, our band's music is not limited to marches and anthems. Audiences hear Broadway show tunes, TV theme songs, big band swing, Dixieland, rock and roll, and even Latin music. Our band often features vocalists from within the organization. Above all, an entertaining performance is our goal! Many members of our band are military veterans or are currently serving in the National Guard. Other members are civilians who play for the love of the music and the desire to entertain area audiences, with most having relatives who are or were military veterans. All members are non-paid volunteers. Musicians range in age from early 20s to over 80, and the musical skills of each also range from amateur to professional. Our band is proud to count among our numbers former area band directors and professional musicians. 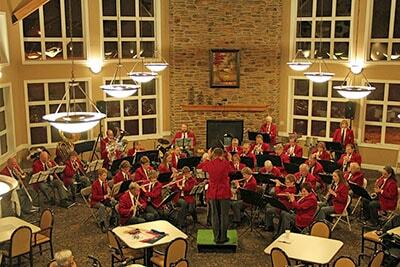 The Red River Valley Veterans Concert Band currently schedules over 40 concerts per year. We enjoy traveling to our audiences, giving many a chance to hear the music that simply warms the heart & soul. The band’s music is especially endearing to those in long-term care centers where attending a public concert hall outside their residence would be difficult or impossible. 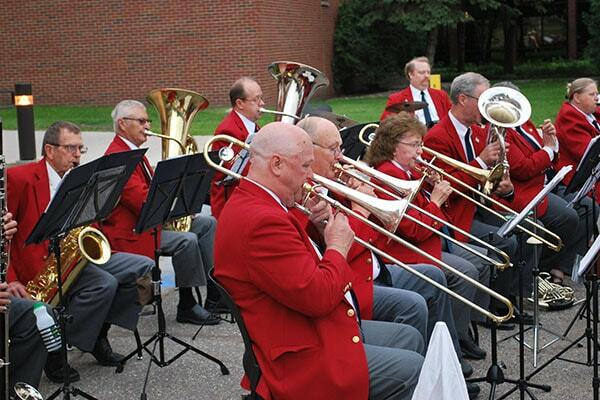 The band often performs two concerts at two different venues in a single evening - one at the local retirement home; and a second at a public venue, such as a sponsoring veteran’s club, community auditorium, or wherever a space might be available to hold a concert! During the winter, performances are limited to the F-M metro area due to weather and travel concerns. 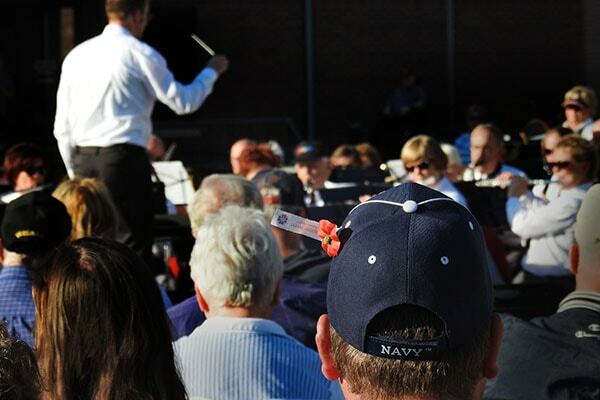 The RRVVCB has performed for a variety of different events to commemorate Patriots Day, including local area school programs, public commemorative events, and event special events organized by the band itself. These opportunities often times create special memories for young and old as we celebrate our country’s freedom and all who’ve been a part of ensuring that freedom for its citizens! Another special day is Veterans Day. Every November 11, the band performs numerous concerts throughout the metro-area of Fargo-Moorhead-West Fargo & Dilworth, paying tribute to veterans. In 2017, the band performed six different concerts at six different venues starting at 11:00 AM with a community celebration, and continuing with five more concerts hosted by area veterans clubs. The last concert of the day was at 7 PM. While its an exhausting, demanding day for the band, they revel in the continuance of its mission, and are always rejuvenated from the enthusiastic crowds for which they perform! The RRVVCB band provides the music for the Memorial Day prayer services at Riverside Cemetery in Fargo. Hundreds of people attend this service, which routinely has special dignitaries and guest speakers attending. 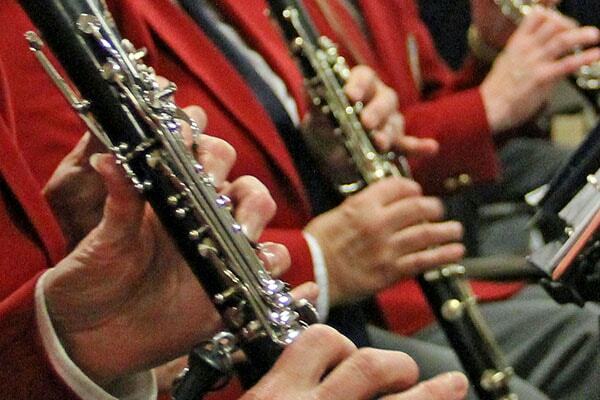 The Red River Valley Veterans Concert Band began as the Gilbert C. Grafton American Legion Post 2 (Fargo) band, performing regularly as entertainment for area military clubs, much like the military bands did for our service men & women throughout history. In 1997, the group incorporated as the Red River Valley Veterans Concert Band, with goals of attracting more musicians, more donors, and sharing its musical enjoyment by performing more public concerts and performing in a larger area of the surrounding region. Bernie McKigney, a Vietnam Veteran and former director of the US Army 188th band, has directed the band for over 20 years. Amy Johnson was co-director in 2006. In 2009 Aaron Romain became a co-director with Bernie as the two men continue leading the band on its mission. The all-volunteer band members share in the many tasks required to keep the band going, from maintaining a library of music; planning, organizing, and coordinating all concerts; keeping the books; tending to the uniforms; maintaining the bands social media and publicity needs; and pitching for any other needs the band has to continue its mission of promoting patriotism through music. The band is governed by board of directors, elected by the members from within their ranks. The board elects the officers for band leadership. Board members have rotating, three-year terms and can be re-elected to the board. Except for a minor compensation paid to the two co-directors, no band or board member receives any compensation for their time or instruments. Arrange for a special concert performance. Audition to become a member of our band. Sponsor our band with a donation. If you’d like to help contribute to a wonderful cause, please consider a donation to the RRVVCB today! The band accepts checks or credit cards, and all donations are deductible as the band is a 501(c)(3) non-profit organization!